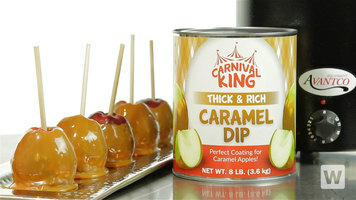 Trust Carnival King's caramel dip for making delectable caramel apples and other sweet confections. This smooth dip has a classic and creamy caramel taste that is reminiscent of fall days at the fair or strolling through summer carnivals. 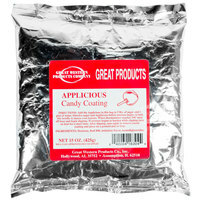 It quickly and easily enhances the professional-quality appearance and rich, sweet flavor of your caramel apples and concession treats. 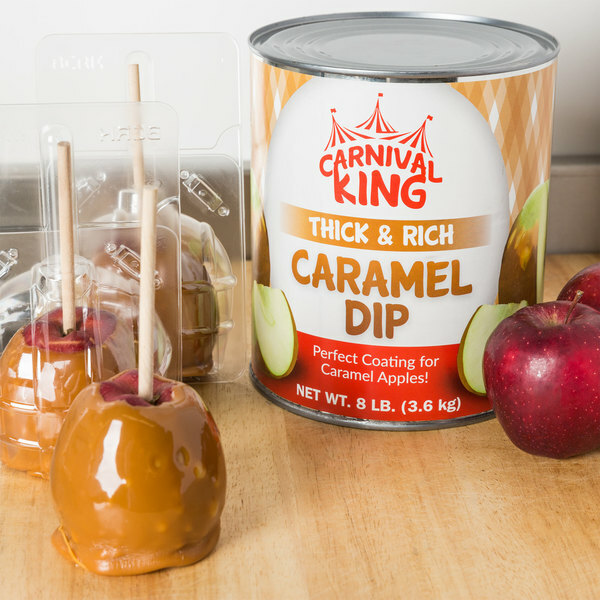 "Carnival King Caramel Dip is perfect for making caramel apples. It's thick, rich, and taste delicious. I wouldn't trust any other caramel for my business." Featuring a golden brown color, this silky smooth glaze is perfect for coating fresh apples, covering cake pops, making candies, or even baking. 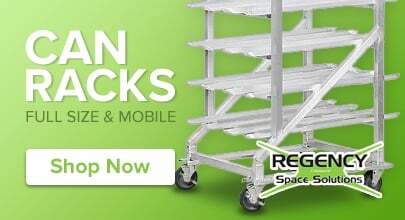 Use it as a base and add sprinkles, chopped peanuts, or other customized toppings to boost profits and bring gourmet flavors to any concession stand. This caramel apple dip is incredibly easy to apply because it sticks firmly to apples, and as an added benefit, doesn't get grainy over time. The bulk size of the #10 can will keep your concession stand or bakery in great supply for all of your sweet treats. When used with a food warmer that fits #10 cans, such as the 6 qt. Avantco W300 countertop warmer, there's less mess and you'll be able to save time cleaning up. To use, take the lid and wrapper off of the can and place the can in the warmer. Fill halfway up the can with water. Set the temperature setting to 12, and wait 1-2 hours until you reach ideal dipping temperature (around 175 to 185 degrees Fahrenheit). Dip apples and allow time to cool. It's that simple! When this product arrived it was solid in the can. Is this normal? Yes, this product has a different consistency than a caramel sauce and is solid in room temperature. It must be heated in a food warmer before use. This video shows you how quick and easy it is to make delicious caramel apples your customers will love! This video will explain how to make caramel apples using eco-friendly skewers, Carnival King caramel dip, and an Avantco W300 soup warmer. To begin, remove the insert from the warmer and add 32 oz. of water. Preheat the warmer to the number 8 setting or medium high heat. While the unit is preheating, remove the label from the caramel dip can and open the can. Remove the lid from the caramel dip can and insert it into the preheated soup warmer. Place the soup warmer lid back on the soup warmer and let it heat for 1-2 hours. You will want the temperature of the caramel to reach 175 to 180 degrees Fahrenheit before use. Be sure to stir the caramel once it has reached this temperature. Next, skewer room temperature apples and dip them in the caramel. 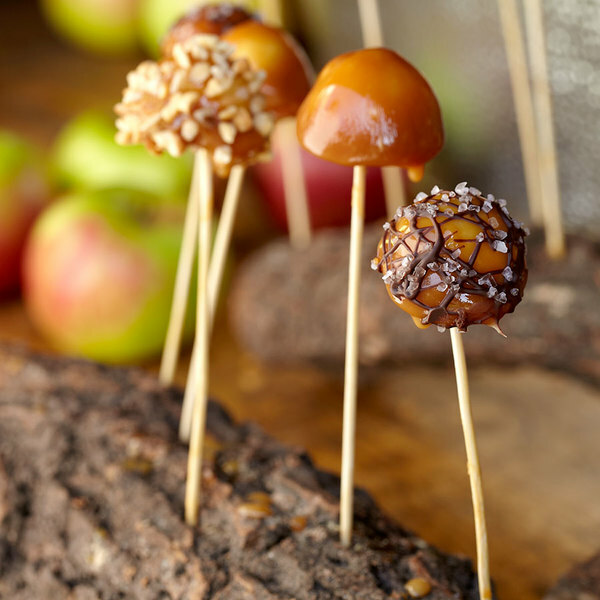 Spin skewer between your fingers to help the excess caramel come off the apple. Then place on a sheet and let cool for 20 minutes before serving. The caramel dip was a hit with my customers. The product arrived just in time for my holiday sale. The dip is very thick and rich. It provides the best coverage on large apples. My custom double dipped apples where a hit and I will always use this product. I would like lower shipping cost though. Ordered 2 cans and I was able to cover about 100 apples with 2 cans. I didn't have the warmer so I just used a big stainless pot with water and canning lids on the bottom. Worked perfect. This caramel is delicious! I will definitely buy again. I use a crock pot when warming as instructed and that worked great. The caramel apples were delicious. I am going on 3 hours and the dip is not even close to being the right viscosity. I am glad I tried this prior to my event because the video says 1-2 hours. THAT IS VERY INCORRECT, please try this dip out prior to using for an event. We hope to do 300 caramel apples and this would NOT be possible with this dip unless you have 10 different heating apprentices. Thank you for your feedback! We are sorry this caramel sauce is not melting correctly for you; we recommend heating this dip to at least 175 to 185 degrees. If you have questions, please contact our Customer Solutions team. Super convenient and soooo easy to use to make dipped gourmet apples! Saves the trouble of melting caramels or cooking condensed milk! Definitely will be ordering more! Our go to for caramel apples. 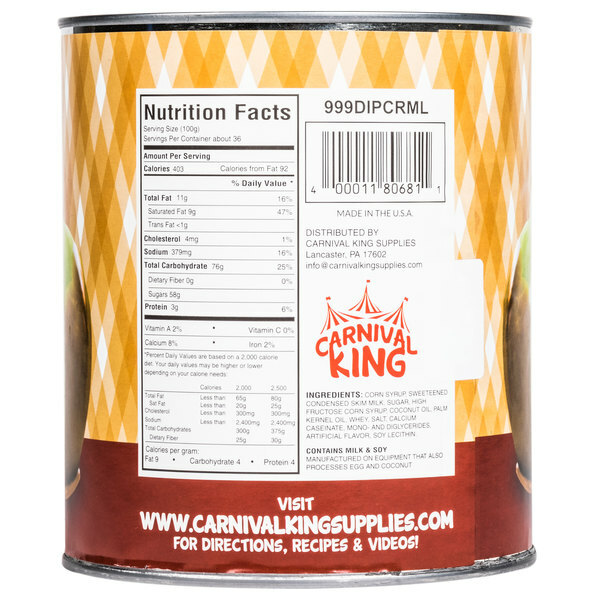 There are defiantly better tasting brands out there, but for the price, you can't beat Carnival King. The kids love em. OMG! 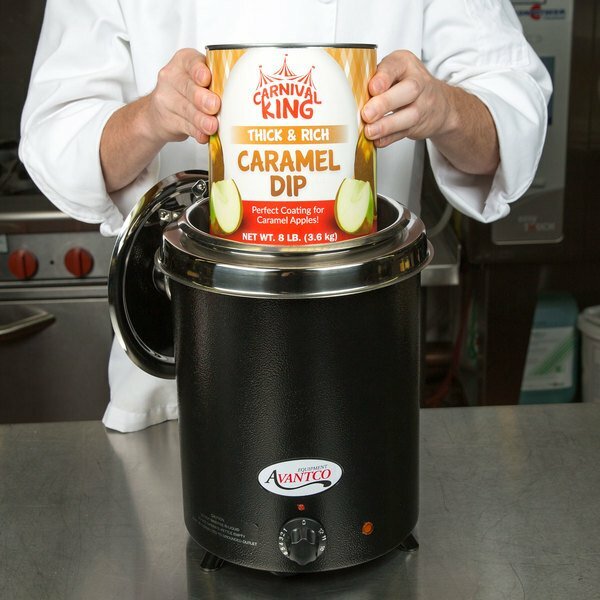 I can't say enough about this caramel dip for apples! It was so good that we wanted to sit and eat it all with a spoon!!! I have been using this caramel for 1 year now, I used to use Gold Medal and this is very comparable quality. I also use it to make other caramel treats. I have never been disappointed with a carnival king product. 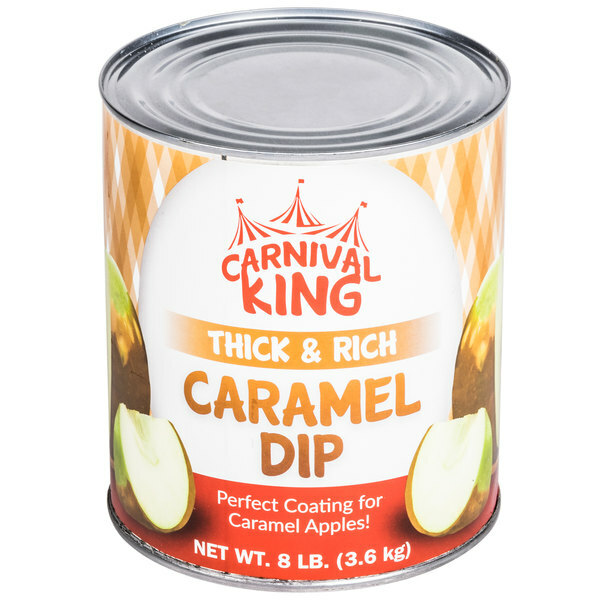 That is why when I need caramel dip I went straight for the carnival king brand. The caramel is very good and it sets really well. 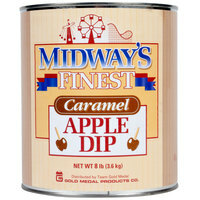 I had never used carmel out of the can but this carmel was the perfect consistency that I need to make Caramel apples. I recommend it. 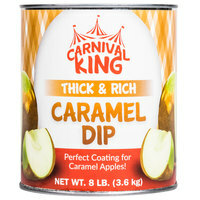 The Carnival King caramel dip is delicious and a very good quality for dipping our apples and pretzel rods. The can is a great price and easy to warm up. Great for caramel apples! We dipped a bunch last fall. I used a crock pot but it'd probably be better in a warmer. Will order again for this fall. Very good product for making caramel apples. They are always a hit in our store in the fall. The kids in the neighborhood can never get enough of them. Like this caramel sauce, however don’t use it for caramel apples any more. 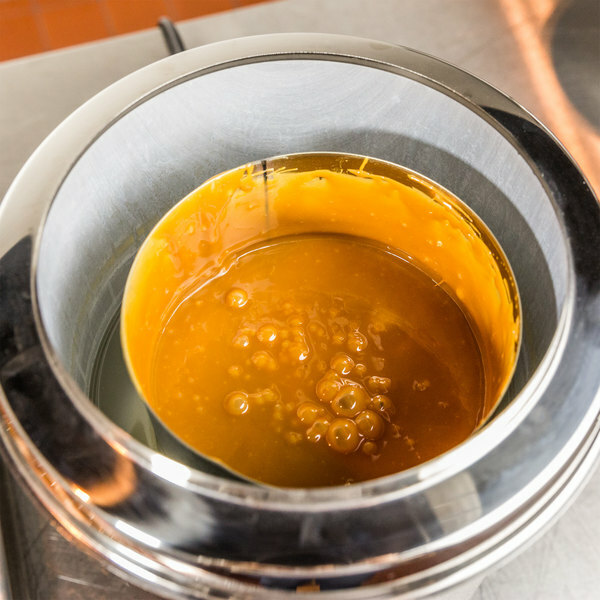 It takes too long to soften, so we let it melt on the stove and use it in any of our bake items that call for caramel. Great taste, good price?? Our store tried a lot of caramel before we decided on this specific caramel for dipping our apples. We think it has the best taste and consistency of anything that we've tried. A very easy to use caramel dip that saves us the headache of creating the perfect dipping sauce. 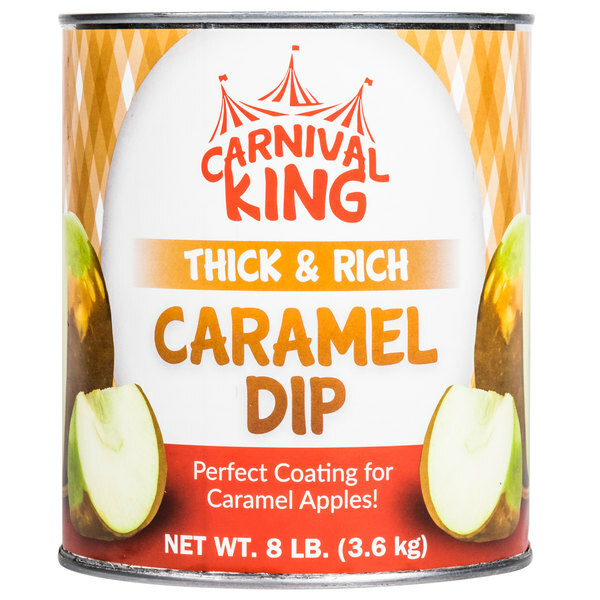 The Carnival King dip is easy to warm up and coats the apples nicely for great tasting fall treats.